Pressure transducers, also known as pressure transmitters or pressure sensors, are used to convert pressure into analog electrical signals. Stain gages are bonded into the diaphragm of the transducer. The gages are wired into a Wheatstone bridge configuration. The deformation of strain gages converts pressure into an electrical signal, which is used to drive further process. Nowadays, pressure transducers are made from stainless steel, which makes them even more sturdy and reliable. This helps them withstand unfavorable conditions, such as vibration, humidity, or extreme temperature. In spite of this, sometimes it does happen that the installation fails. This failure is due to issues such as multiple grounds, short circuits, improper wiring, inadequate power supply, incorrect polarity, system operation issues, and so on. This post will focus on some troubleshooting guidelines to help you keep a check on transducer failure. Basic Understanding about the Pressure Transducer: The basic requirement of troubleshooting a pressure transducer is that the person doing it should have sound knowledge about the equipment. The person should be able to use digital multimeters for measuring resistance, current, and voltage. Also, not to forget, the person doing the troubleshooting should have access to a 24 VDC power source. 2-Wire Transducer Connected to a Pipeline: The first thing is to ensure that the -24 VDC is connected to the common, while the +24 VDC is connected to the +excitation of the transducer. Now, disconnect the wire connecting control circuit to the transducer’s +signal. Place – lead of the voltmeter on the common, and the + lead on the + signal of the transducer. Does the transmitter give a voltage output as mentioned in the data sheet? If the answer is yes, then the transmitter is operational. 2-Wire Transducer Removed from a Pipeline: The most common problem with the 3-wire pressure transducer is either no or unexpected signal. To tackle this, remove the transmitter from the control unit and pipeline. Check and identify all the terminals, with the help of operating instructions of the model. Now, power the unit and place the + lead of the voltmeter on the + signal of the transmitter, and – lead of the voltmeter on the common. If the transmitter shows the expected reading, then it is working fine. 4-20mA Transducer: Ensure that the pressure transducer is connected to the control unit and pipeline. Now, connect the 24 VDC to the red wire of the transducer. Remove the wire of the transducer that is connected to the control unit. The lead going to the control circuit should now be connected to the – lead of the digital milliamp meter. Connect the + lead of the digital milliamp meter to the black wire. Observe the output signal. Does the transducer provide a 4mA output signal, without applying pressure? If yes, then the transducer is operating fine. 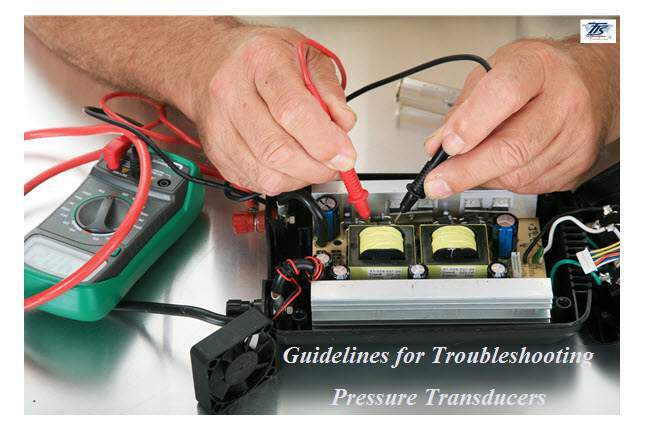 When you follow all the guidelines for troubleshooting explained in this and the previous post, it will make your job easier to ensure the proper working of the pressure transducer. You can take help of the experts in the field such as The Transmitter Shop, who have a decent experience in fulfilling instrumentation requirements.